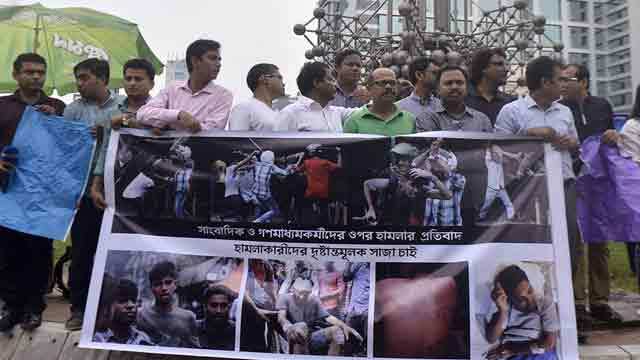 Dhaka, Aug 7 (Just News): Journalists across the country and global media watchdogs have strongly condemned the recent attacks on media persons covering student protests for road safety. They also demanded the immediate arrest and punishment of the attackers. Journalists also formed human chains in Dhaka and Satkhira yesterday protesting the attacks in the capital. Similar programmes are set to take place today. Shampadak Parishad (Editors' Council) yesterday expressed grave concern over the indiscriminate attacks on journalists. Condemning the incidents, it said nearly two dozen photojournalists and reporters of newspapers and TV channels were physically assaulted. One from AP and a freelance photographer were mercilessly beaten by stick-wielding “activists” in the presence of policemen, who did nothing to protect the newsmen on duty. "Shampadak Parishad condemns these attacks on journalists and the role played by the police who allowed the attacks to continue without making any attempt to stop it," reads a statement from the Parishad, issued by its Secretary General and Editor and Publisher of The Daily Star Mahfuz Anam. The violent opponents of the movement for safe roads broke cameras and video equipment and took away mobile phones of several working journalists, it said. The statement reiterated that freedom of expression and that of the media are guaranteed by the constitution of Bangladesh and not allowing the media to function freely ultimately destroys democracy, which is one of the hard earned gains of the Liberation War. International Federation of Journalists (IFJ) yesterday condemned the arrest and unabated attacks on journalists covering demonstrations in Dhaka and elsewhere in Bangladesh. “Such acts of arrest and violence are against press freedom and hinder independent journalism,” it said in a statement. South Asian Women in the Media (SAWM) also condemned the brutal attacks on school and college students as well as journalists who were beaten while on duty. “We appeal to the government of Bangladesh and to Prime Minister Sheikh Hasina to instruct law enforcers, as well as various groups representing the ruling party, to stop physically attacking, intimidating and detaining civilians,” said a statement of SAWM, a network of women media professionals in South Asia working for freedom of press. These attacks and detentions are violations of people's constitutional rights and of freedom of the press and freedom of speech and expression. They are contradictory to democratic values, it said. In a statement, Dhaka Reporters' Unity (DRU) President Saiful Islam and General Secretary Shukkur Ali Shuvo demanded that the government ensure safety of journalists. Expressing deep concern over the attacks on the newsmen, they said the criminals swooped on reporters at different places of the city, beat them up and snatched their cameras and mobile phones. Dhaka Union of Journalists (DUJ) and Bangladesh Federal Journalists Union (BFJU) said 20 to 22 journalists came under attack and were tortured while covering the student's movement. "The incidents took place when journalists were taking photographs and gathering news about machete-wielding attackers. This is not accepted at all," reads a joint statement of the two journalists' bodies. It mentioned that those incidents would create conflicts between journalists and political forces, which would ultimately harm the state and the society. In this era of advanced information and communication technology, the identification of the attackers was not difficult, says the statement. Journalist leaders hoped that police would be able to track down the attackers soon while government would ensure their trial. "Government has to take the responsibility if the attackers are not punished," said the statement. In a statement yesterday, Rajshahi Press Club yesterday expressed concern over the attacks on journalists. It also demanded proper investigation into the attacks and exemplary punishment of the attackers, reported our Rajshahi correspondent. Leaders and members of different journalist associations formed human chains in Dhaka and Satkhira, expressing concern over the attacks. They slammed police inaction during the attacks, saying it encouraged goons to swoop on reporters, photographers and camerapersons of different newspapers and TV channels. At a human chain in front of the Supreme Court in Dhaka, about 50 members of Law Reporters' Forum demanded exemplary punishment to those involved in the incidents. They threatened to wage tougher movement if the government failed to meet their demand. The forum leaders said journalists were not anyone's enemy. Yet, they were facing harassment and coming under attacks frequently. They sought the prime minister's intervention in bringing the culprits to book. Another human chain was formed at Sonargaon Hotel intersection. Members of Satkhira Press Club formed a similar human chain in the district town, reports our Satkhira correspondent.